Mooresville, NC – November 3, 2016 – That is, a championship banner year! Cunningham Motorsports’ 2016 ARCA Racing Series season has been one that teams dream about…and the organization has now experienced. With nine wins in the twenty races this season, the three Cunningham teams have spent a lot of time in victory lane this year. Rookie Chase Briscoe made his third Series start with a fourth place finish at Daytona International Speedway, to start the season. Right after that race was the only time throughout the season that Briscoe was not leading the championship points battle. Briscoe even surprised himself when he grabbed his first pole award in the next race at Fairgrounds Nashville Speedway, with a new track record. He followed this pole up with poles at the next four short tracks, including Salem Speedway, Toledo Speedway, Madison Speedway and Winchester Speedway. 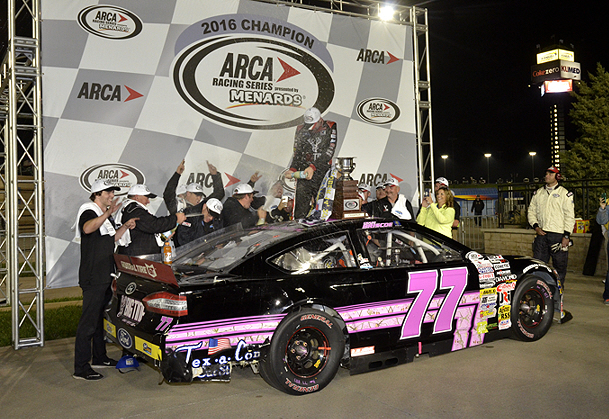 Briscoe grabbed his first ARCA Series checkered flag at Winchester Speedway, after leading 147 of the 200 laps. His first win seemed to open the flood gates for Briscoe as he and his team visited victory lane in the next three races. Briscoe followed up his first win with another win at the next race at Iowa Speedway, dominating the last half of the race. The rookie made it three-in-a row at Lucas Oil Raceway. His fourth consecutive win came at Pocono Raceway, once again, in dominating fashion, after leading 51 of the 60 laps. After four more top-6 finishes, Briscoe took his fifth victory at Chicagoland Speedway, after leading 94 of the 100 laps. Going into the season finale at Kansas Speedway, Briscoe had to only start practice to earn his and Cunningham Motorsports’ first championship banner. But, don’t think that fact would lead Briscoe and his crew chief, Chad Bryant to take it easy on his competitors. In addition to the championship banner, both Briscoe and Bryant wanted to close their 2016 campaign with victory number 6. And that is exactly what they did, leading 68 of the 100 laps on way to victory lane in the season finale. Before the season finale, Briscoe and his No. 77 Big Tine team had already earned numerous other special awards. By just starting the final short track race in the Short Track Challenge by Protect Plus at Salem Speedway in September, Briscoe earned back to back Short Track Challenge awards for the Cunningham organizations. Additionally, at Salem, Briscoe earned enough points to take the SCOTT Rookie Challenge award. But, per the ARCA rule book, an individual driver cannot accept both the Rookie of the Year award and the championship. So, Briscoe will be accepting the Series championship…not the Rookie of the Year Award. By pulling into victory lane at Chicagoland Speedway in mid-September, Briscoe earned consecutive Bill France 4-Crown Awards for the Cunningham organization. On the strength of finishes of 4th at New Jersey Motorsports Park, a win at Lucas Oil Raceway, 5th at Du Quoin fairgrounds and the win at Chicagoland (an incredible 2.75 average finish in the four races), the 21 year old Mitchell, Indiana resident earned his second prestigious award of the season. Unknowingly at the time, Briscoe earned the Menards Pole by Ansell Award after his third pole award at Toledo Speedway in May….since the next closest pole sitter has just two poles. Briscoe grabbed his sixth pole award at the Kentucky Speedway. The Valvoline Lap Leader award was also decided a number of races before the season ended, with Briscoe ultimately leading 949 laps to 213 laps for his nearest competitor. With a 5.15 average finish and a 3.75 average qualifying effort in the twenty races that composed the 2016 season, the rookie also earned the S & S Volvo Laps Completed Award, the R.E. Lightning Challenge Award and the Fast Track Award. In addition, Cunningham earned the Manufacturers title for Ford. Briscoe finished his rookie season with six wins, 14 top-5 finishes and 18 top-10 finishes. The Cunningham organization’s awards weren’t limited only to Briscoe. For the third year in a row, crew chief Chad Bryant will receive the Cometic Crew Chief Award. And that is with three different drivers…two rookies and a veteran. Cunningham Motorsports shared victory lane celebrations this season with three of their other drivers, as well as Briscoe.…..Myatt Snider, Parker Kligerman and Austin Cindric. With ten different drivers taking the wheel of the No. 22, crew chief Paul Andrews had his hands full this season—earning the checkered flag with two of those ten drivers. Myatt Snider, 21 year old rookie, joined the elite ‘club’ of debut winners, when he earned the trophy in his first ARCA Series race at Toledo Speedway in May. Parker Kligerman had an exciting homecoming with his former team at New Jersey Motorsports Park, where he earned his first ARCA Series pole, before grabbing his 10th Series checkered flag. Another young rookie, Austin Cindric earned his first ARCA victory in his fifth Series race at Kentucky Speedway in September. Brian Wilson was the crew chief for the No. 99 Ford that celebrated in victory lane. The 2016 ARCA Championship Awards Banquet is the culmination of a remarkable season for the Cunningham organization. Co-owners Briggs Cunningham and Kerry Scherer will join Briscoe and his No. 77 Big Tine team when they receive all of their accolades on December 10 at the Indiana Convention Center in Indianapolis, Indiana. Tickets to join the celebration are available at www.arcaracing.com.